The idle control valve (also known as a stepper motor) opens and closes to let air into the engine to stabilise idle when the throttle is closed. As you would expect it is located on the inlet manifold behind the throttle body. How do I know if it's faulty? 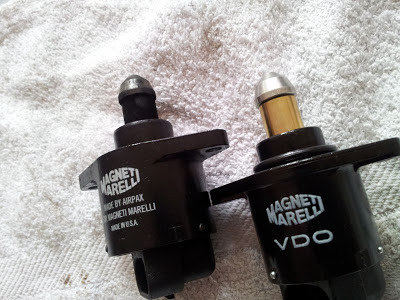 If you are buying a new one it is recommended to only buy genuine Magneti Marelli. These are available from Peugeot or slightly cheaper from Euro Car Parts or CarParts4Less. At the time of publishing this (27/06/13) the CarParts4Less part number is 436730100 for a Magneti Marelli idle control valve. Cheap pattern parts are known to be of low quality (surprise surprise) and will likely fail 6 months later. Buy cheap pay twice. Luckily cleaning or replacing the part is very quick and easy. 1. Disconnect negative terminal from battery. 2. Squeeze to unplug the vacuum hose (A) and remove MAP sensor plug (B) to give better access. 3. 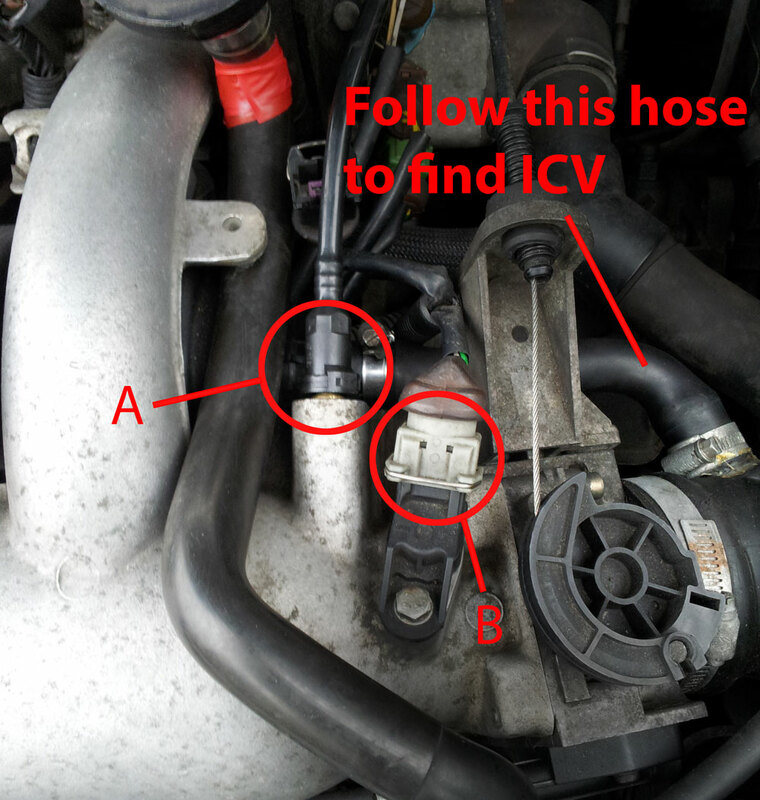 Remove two 10mm bolts holding the ICV housing to the inlet manifold and give it a gentle tug. 4. Disconnect multi-plug at the bottom and unplug it from black rubber hose. 5. The actual solenoid is held in place by two phillips screws. Undo these and pull it apart (remember which way the multi plug connector faces). 6. If this has never been apart there will be loads of oil and gunk in and around the solenoid and also the plastic housing and airways. Clean the hell out of these with WD40 or carb cleaner and an old rag. 7. At this point you either replace your old one or switch it for a shiny new idle control valve (remember to attach it the right way so the plug faces downwards). If you install a new ICV make sure you switch over the rubber O-ring seal. 8. Put it all back together and reconnect the battery. It is also advisable to do an ECU reset. 9. Take for a drive. The first idle may be a bit rough as it takes a while for the new ICV/stepper motor to calibrate itself. Comments and questions welcome below.